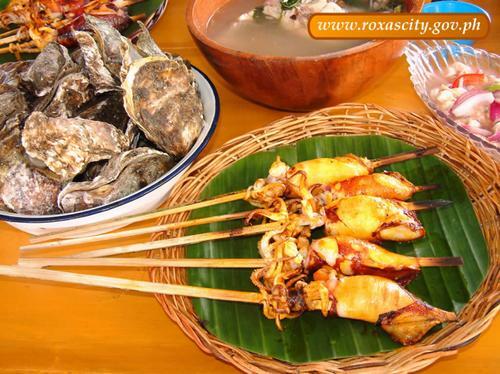 The abundance of marine life makes Roxas the "Seafood Capital" of the Philippines. It celebrates meaningful festivals such Sinadya sa Halaran and the Diwal Festival. Roxas City is situated at the Northeastern tip of the Island of Panay. It is located 250 nautical miles southeast Manila, 118 kilometers northeast of Iloilo City, and 86 kilometers east of Kalibo, Aklan. Travel Time to Manila is 45 minutes by air and 18 hrs. by boat. The city belongs to the first political district of the Province of Capiz along with the Municipality of Maayon, Panay, Panit-an, Pilar, Pontevedra, and Pres, Roxas. It comprises forty-seven (47) barangays of which eighteen (18) are urban and twenty-nine (29) are rural.